Austrian in origin and known there simply as “GV”, we have grown this variety since 2010. 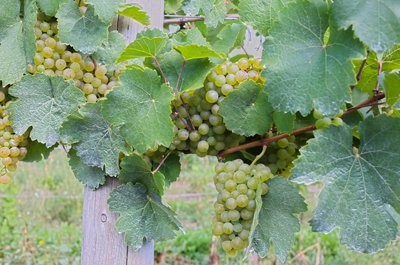 Very fruitful variety with greenish yellow berries, the vine is rather susceptible to downey and powdery mildew. The fruit is mid-ripening and usually is harvested mid-late September. Seems to be semi-tolerant of NY winters. When yields are high, the wines are crisp and fresh, and can in some cases be concentrated and ages well. Typically dry and full bodied with a peppery nose, Grüner Veltliner can have a peachy and fruit dominated aroma/flavor.